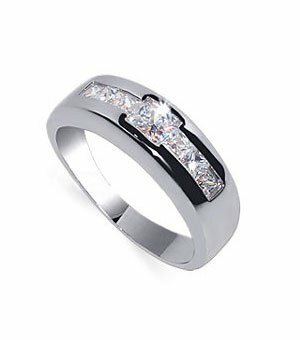 Men’s Crystal Clear Cubic Zirconia and Sterling Silver Channel Set Ring.One larger central stone is surrounded by four smaller stones on either side. A classic and stylish piece, wearable for daily and special occasions. Mostly used for a groom’s wedding ring. Uncomplicated and robust, your special someone will enjoy the rhodium plating which gives the look of white gold and makes tarnishing less likely. * From 4mm to 7mm at widest part of band.Ring will be shipped in a Free gift box making it easy for you to surprise your special someone. Thank you for shopping at Gem Avenue!